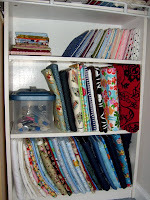 Petit Design Co: Organize your Fabric Stash! As promised here is (the first installment) my Fabric Folding Tutorial so that you can get your fabric stash under control! Part one is has instructions for folding cuts of fabrics of 1 yard or more of 42"-44" wide fabric. The backer boards (a.k.a. backing boards, comic storage boards) are typically found in a pack of 100 for about $10-$12. They are usually archival quality and acid free. However they are generally only coated on one side. Now you might not care as to whether your fabric is protected from touching a non acid free surface, but it will extend the life of your fabric. So will keeping your fabric dust free. There have been arguments to both sides of this dilemma, which I won't go into. I figure that fabric is a pretty expensive hobby at prices of up to $9 a yard or even $15 yard for imported Japanese prints (which I love.) Therefore I choose to use 2 one-sided boards back to back so that my fabric is touching an acid free surface. If you can find, and splurge, the boards that are coated on 2 sides then only use one board. If you don't care about your fabric touching regular card board, then by all means go ahead and use one board. I promise I won't send the fashion police after you! Part 2 will be coming soon and will cover folding fabric shorter than 1 yard and fat quarters. I absolutely need to do this. I don't know a shop that sells these boards near me, but I just found them on ebay. I just stumbled upon your blog. I am having so much fun browsing!!! I tried the link for your fabric folding tutorial and I get a message that says the link is broken. Can you send it to me?